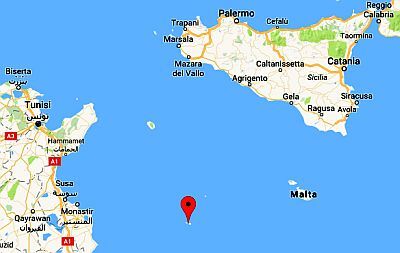 In Lampedusa, the southernmost point of Italy, the climate is Mediterranean, with mild, relatively rainy winters and hot, sunny summers. However, given the latitude, it is even milder than in Sicily: the average temperature ranges from 13.5 °C (56.5 °F) in January and February to 26.5 °C (79.5 °F) in August. However, the wind blows frequently. On the neighboring islands of Linosa and Lampione (which, along with Lampedusa, form the archipelago of the Pelagie Islands), the climate is similar. Rainfall in Lampedusa is definitely scarce, and amounts to a meager 325 millimeters (13 inches) per year. The rains reach their peak in autumn, and then decrease rapidly already in the second part of winter; in practice, in summer it never rains. It's no coincidence that the island's landscape is arid. Winter is very mild, in particular, night temperatures remain high, averaging above 10 °C (50 °F). There are many sunny days, but also periods of bad weather, with wind, rain and thunderstorms. Given the very low latitude (we are on the 35th parallel), cold spells are very rare and not intense: on colder periods, lows go down to around 5/7 °C (41/45 °F) and highs remain around 10 °C (50 °F). However, the wind can exacerbate the feeling of cold. In spring, the temperature gradually rises; the rains become less and less frequent, and already in April they are rare. The sun shines more and more unchallenged. Summer is hot and sunny, a bit sultry but tempered by the breeze. Although typically the Azores Anticyclone dominates, the sirocco from nearby Africa, which is able to raise the temperature, but also to bring the desert sand, can sometimes blow. However, the highest records are not very high: just 35/36 °C (95/97 °F) because of the influence of the sea. In autumn, the temperature is initially high, and gradually decreases. September is almost always a month with summer characteristics, especially in the first half; usually in the end of the month the first disturbances pass, accompanied by thunderstorms. In October, the temperature is still pleasant. The amount of sunshine in Lampedusa is great in summer, when clear skies prevail; in winter, there are several sunny periods, but they alternate with periods of bad weather, with rain, wind and thunderstorms. On the Rabbit Island ("Isola dei conigli"), an islet located near Lampedusa, in front of the Rabbit Beach ("Spiaggia dei conigli"), the turtles Caretta caretta come to nest. 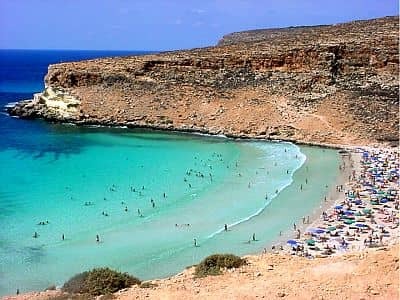 The sea in Lampedusa is warm enough for swimming from July to September, as generally happens in the Italian southern seas. In June, the sea is still a bit cool, while in October the water temperature is still decent, about 23 °C (73 °F). The best time to go to Lampedusa, for a beach holiday, is the summer, from June to September. The water temperature is comfortable enough from July to September, although in September, which overall is still a good month (especially in the first half), the first disturbances occur (although more rarely than in peninsular Italy because of the low latitude). In June, as mentioned, the sea is still a bit cool, while in May it is still cold, and sometimes the air too can be a bit cool for sunbathing (perhaps because of the wind). April and May are suitable for hiking, while in summer it can sometimes be too hot to stroll outdoors (although as I said this rarely happens). In October, temperatures are mild, but the days are shorter and the weather can be rainy and windy.